James Harold Doolittle constructed his own glider from magazine plans in 1910-12. He received a degree in mining engineering from the University of California in 1922, and in 1925 he received one of the first doctorates in aeronautics from Massachusetts Institute of Technology. He entered the U.S. Army Air Service in 1917 and was rated a military aviator in early 1918, serving throughout the war as a gunnery and flight instructor. His advanced skill as a pilot, combined with his fearless nature, made him a leader. This, combined with his engineering background, brought him naturally into experimental test flying at the Air Corps Test Center at McCook Field, Ohio in 1922. His achievements during the golden age of aviation are legion. In 1922 he was the first to fly across the United States in a single day, from Pablo Beach, Florida, to San Diego, California. In 1925 in a Curtiss P-1 pursuit plane, he performed the first outside loop. As winner of the 1925 Schneider Trophy Race, he established a world record speed of 245 miles per hour. His greatest contribution to the advance of aviation during this period was his work with the Guggenheim Full Flight Laboratory, developing instruments for flight in adverse weather. On September 24th 1929, Doolittle made the first "blind" flight, taking off, flying a set course, and landing while flying under a fabric hood so he could not see outside the plane. He received the Harmon trophy for the feat. Placed in command of U.S. Air Forces in North Africa, he once again demonstrated his talent for leadership, personally participating in combat operations with his units. In 1944 he was chosen to lead the mighty Eighth Air Force in England during the crucial period of the invasion of Europe. 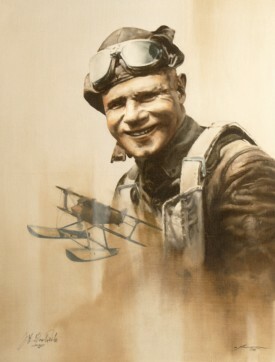 Much honored by his country and the Allied Nations, Lt Gen Doolittle retired from the Army Air Forces in 1946 and returned to his position at Shell Oil. In 1985, although long retired from active duty, retired Lt Gen James H. Doolittle became Gen James H. Doolittle when President Reagan and Senator Goldwater pinned on the same four-star insignia that Gen George Patton had been given on the occasion of receiving his fourth star more than 40 years earlier. In addition to the nation's top award, Doolittle also received two Distinguished Service Medals, the Silver Star, three Distinguished Flying Crosses, the Bronze Star, four Air Medals, and decorations from Great Britain, France, Belgium, Poland, China, and Ecuador.